I interviewed Jane Goodall - a hero of mine! 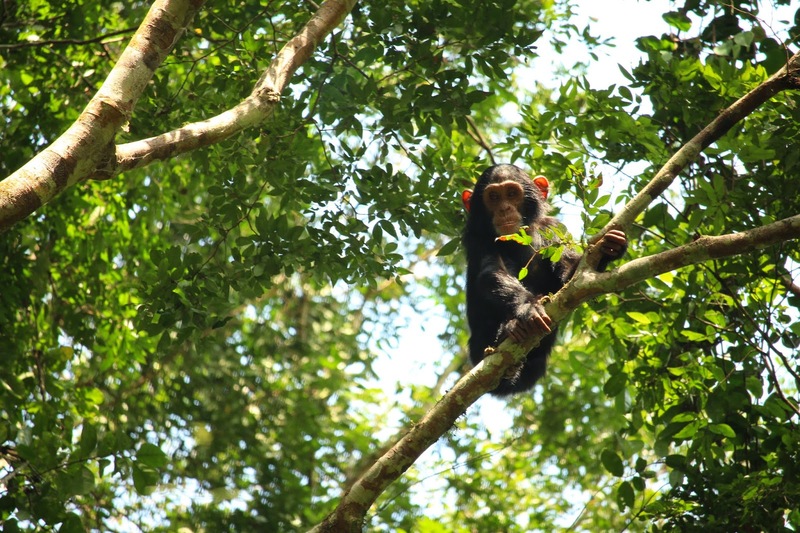 A young chimpanzee in the trees at the Budongo Forest in Uganda. Who is watching whom? Articles under the Mongabay Prize for Environmental Reporting grant I received have started coming out! This is a 6-month grant to report on tropical forest conservation that allowed me to travel to Uganda to report on some initiatives and projects there. Several more articles will be coming out, but here's a start! If you have been following any sort of wildlife or science news, you may have seen that the legendary Dr. Jane Goodall turned 80 on April 3rd. On the Sunday before her birthday, I interviewed her by phone for Animal Planet's 80 Years of Jane online content. She was in Montreal about to fly to California, and it was so neat to hear her voice over the phone lines. Although mountain gorillas and not chimpanzees are my favorite animal, in high school I watched many a Jane Goodall National Geographic documentary, as well, and read her book In the Shadow of Man. I have the coolest job! But my favorite articles so far is published on CBS Smart Planet: How Jane Goodall’s legacy is alleviating poverty. This is about the Sustainable Livelihoods Project that I visited near Hoima, Uganda. Not long after I arrived in Uganda, I drove from Kampala to Budongo Forest Reserve with Peter Apell of the Jane Goodall Institute-Uganda, and got all those great quotes on that trip - he is a great interview. I spent a couple of days tracking chimps and such at Budongo, and then drove to the project in the field with JGI's Tomas Acidri, and interviewed one of the community villagers, Joram Basiima, whose photo appears in the article. I was impressed with the project and their approach. More articles from Uganda, and from the Mongabay grant, will be coming soon! Stay tuned!